Photographs that focus on Indigenous causes are part of a new three-person show documenting activism. “All three artists are political and make art to change people’s lives. All three artists accept that there is a social responsibility in being an artist and that responsibility is of paramount importance – there is no frivolous subject matter here,” said Chris W. Carson in his curatorial statement. Former Alberta Sweetgrass contributor Paula Kirman is joined by Mary Joyce and Juan Lopezdabdoub in the exhibition entitled ART + ACTIVISM. “All three artists are political and make art to change people’s lives. All three artists accept that there is a social responsibility in being an artist and that responsibility is of paramount importance – there is no frivolous subject matter here,” said Chris W. Carson in his curatorial statement. Former Sweetgrass contributor Paula Kirman is joined by Mary Joyce and Juan Lopezdabdoub in the exhibition entitled ART + ACTIVISM. Even before working for Sweetgrass on a freelance basis, Kirman, who is not Indigenous, spent time photographing such protests and events as Idle No More, the Memorial March of Edmonton for Murdered and Missing Indigenous Women, and the Stolen Sisters Awareness Walk. “These events, like all protests, are part of the collective history of our city, of our society. They need to be documented to share, to remember, and to help others understand why these social issues are important,” said Kirman. But it’s not just about snapping photos and telling the stories that, Kirman feels, most main stream media misses. It is also about art. “The more protests I attended and the more photos I took, the more I realized that there is an element of art to protest: the placards and signs. Elaborate costumes. Masks. Performance art, like chanting or actual staged street theatre and dance. As photography itself is an art, I began to see what I was doing as an art form in and of itself, which captures other forms of art,” she said. Kirman became fascinated by photography when her father, a “camera enthusiast,” gave her a Brownie Box camera when she was a small child. As she got older, she developed a strong interest in social justice and human rights and she began capturing those moments with her camera. She began covering activism in Edmonton in 2005. “I started taking pictures and sharing them online, and the reaction was huge. People were sharing them, commenting on them, and the server of my first blog crashed because of the traffic! So, I kept at it,” she recalled. While this is Kirman’s first time having her political art as part of an art gallery exhibit, she is no stranger to her photographs being viewed beyond the Internet and newspaper pages. Some of her protest photographs are on permanent display in the Alberta Legislature's visitor's gallery in the Edmonton Federal Building. Kirman is pleased to be included with Joyce and Lopezdabdoub. “I think we are a very good combination of artists, because we all bring different interpretations of social issues and we are activists ourselves,” she said. “For Joyce, Kirman and Lopezdabdoub, political art needs to be seen and experienced. That age old phrase ‘you shouldn’t talk about religion and politics,’ simply does not apply to those artists that want to change our world for the better,” said Carson in his curatorial statement. Kirman hopes that the show will move the public to think about social issues and to become active. “I hope they see that politically progressive citizen engagement is a part of Edmonton's rich and diverse fabric. That there are issues that need to be discussed, and that everyone can have a voice on society. That protesters should not be marginalized or ignored …. And even in the political, there is art, and art can be a form of communication,” said Kirman. ART + ACTIVISM opened on Sept. 1 and runs through until Nov. 26 at the Visual Arts Alberta_ CARFAC Project Space, in downtown Edmonton. 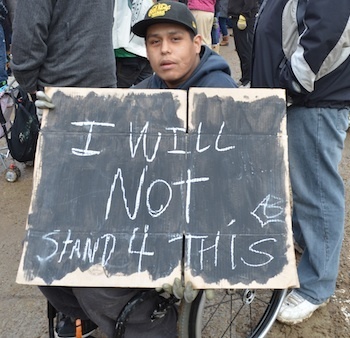 "I Will Not Stand for This" is from a December 2012 Idle No More protest, and is one of the central pieces in the ART + ACTIVISM show. This Idle No More photograph was taken in January 2013 outside of Canada Place in downtown Edmonton.